A silvery, elongated fish with prominent dark, horizontal stripes along the sides. Stripes are typically not offset or broken and 3-5 will extend from behind the head to the base of the tail. Soft and spiny dorsal fins are separate. Gill cover has a very sharp gill plate. Teeth on upper surface of tongue usually in two parallel patches. 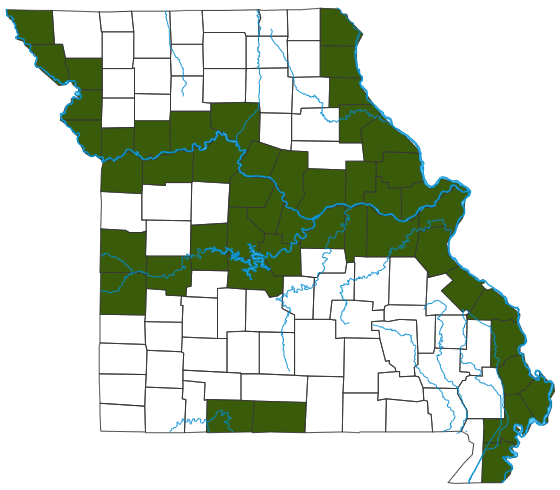 Hybrids between the striped bass and white bass are stocked by the Missouri Department of Conservation in many impoundments around the state. These fish superficially resemble white bass but have 2 patches of teeth on the tongue very close together or else a single distinct tooth patch. Hybrids also achieve a larger size than white bass, exceeding a weight of 5 pounds. Total length: 26-40 inches; weight: 5-20 pounds. A striped bass over 58 pounds was caught at Bull Shoals Lake in 2010. Primarily a marine species native to the Atlantic Coast of North America, the striped bass has been successfully stocked into numerous reservoirs throughout the United States. The species prefers cool, well-oxygenated water and cannot tolerate poor water quality. During the fall to spring months, striped bass can be found throughout a reservoir. However, during summer months the fish congregates in the cool, deep water near the thermocline, the transition between surface and deep water. Numerous studies throughout the United States reveal shad (gizzard and threadfin) and other prey species is the striped bass’s predominant food item. However, since striped bass are carnivorous, adults will occasionally eat crayfish and other fish. Lake of the Ozarks, Norfork Lake, Bull Shoals Lake and occasionally found in the Osage, Missouri and Mississippi rivers. Adults spawn in the spring, usually migrating to the flowing waters of tributary streams. Due to specific spawning requirements, very few self-sustaining populations are found in reservoirs and artificial stocking supports most fisheries. Fish are fast growing, often reaching 24” by their fourth year of life. The species is generally found in open water and in small to large, continuously moving schools. It is believed the fish can live up to 30 years. A large number of anglers prefer striped bass because of its large growth potential and powerful fighting qualities. Many anglers also like the flavorful flesh. Due their large size potential, striped bass are capable of preying on gizzard shad, which can grow too large to be eaten by white bass and other predatory fish, and keeping their populations in check.